When is a war not a war? When it is presented in colors of four? Also, when is a man not a man? When he is a caricature called Logan? Oh! But don’t tell him that I said that! Or otherwise he’ll hit me with a baseball bat. Just like Writer: Jason Aaron; Artist: Renato Guedes; and Publisher: Marvel Comics in January 2012. 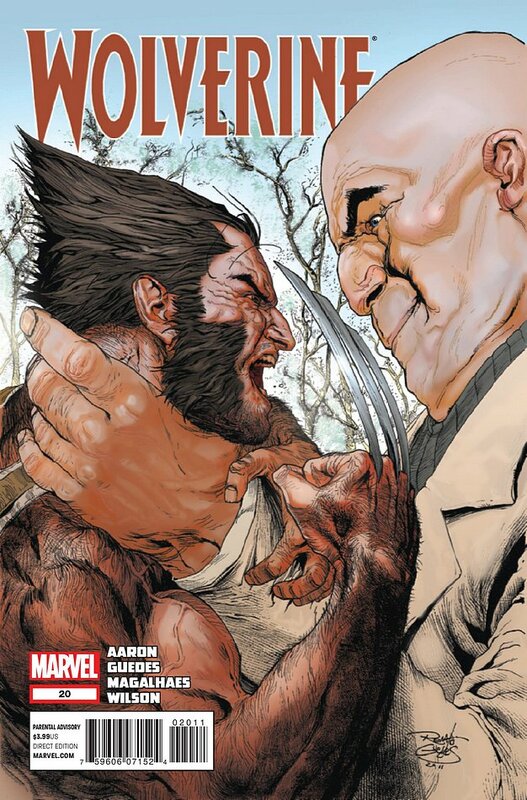 Part One of ‘And Then There Was War...’ is basically, an introductory chapter to a troubling time for Wolverine and Co.
Now this begins when Wolverine stumbles upon a very meddlesome situation within the confines of Central Park. You see, two crime bosses, the Kingpin and Mr Takenaka, are discussing the vacuum left behind due to the death of Silver Samurai, when suddenly, the ‘cannibalistic brothers’ show up, primed and ready to cause mayhem. 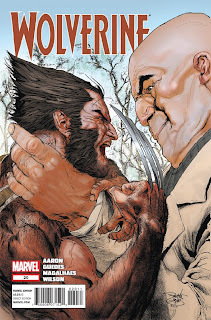 Thankfully, though, special agent Cassie Lathrop is at hand, and aided by Wolverine, manages to subdue this rather confusing turn of events as quickly as possible – sending Mr Takenaka back to Japan – and informing Wolverine and the Kingpin what is going on. Next, in the aftermath of this battle, we are presented with a number of relatable facts. (1) Cassie’s is in the employ of covert specialist, ‘Seraph’, who was hired by Japanese officials to protect Mr Takanaka. (2) The Kingpin does not want any part of ‘this mess’. (3) Wolverine has a very nice taste in women. And (4) It is a shame that Mr Takanaka is killed on route back to Japan by Sabretooth, huh? When Kingpin ‘buggered’ off with his Hand-cronies, I liked it when Seraph said ‘Ah shucks. And here we were just getting to know one another’. You can almost hear the dumbbell beat following that line, du-dum boom-boom. Yeah – I did not mind it in an eighties ‘Starsky and Hutch’ kind of a way. Well, you have to take into consideration that a lot of what is on show, largely relies on coincidences. For example, the ‘cannibalistic brothers’ prior meeting with Wolverine – Wolverine being at the park the same time this was going on – and Wolverine’s relationship with most of the females in this issue. Granted, it was not the most original storyline ever – but it was fun to read all the same. I did have two gripes with this issues art. 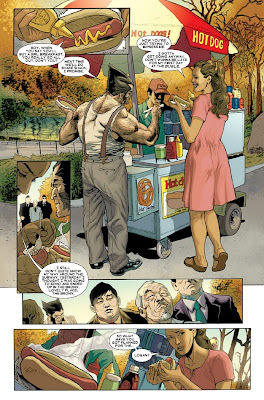 Initially, I did find that the colouring in this issue was a bit over the top at times, as it was kind of distracting where shadows and light are concerned – check out Wilson’s face whist he is in Central Park, it looks like he has a skin condition. And subsequently, though I do like Renato Guedes as a artist, at times, his wares do come across as being a bit too inconsistent – too ‘sparce’ or too scratchy, depending on the breaks. Still, apart from all that – good job. I liked the scene were Seraph tells everyone to ‘Get in the damn Van’. Granted, its not realistic in tone – and does have a somewhat jovial mannner – nevertheless, it was still a fun scene to read. I am afraid to say that I am a bit of a stickler for ‘coincidence’ type tales. You know the type of thing “Oh, and by chance, such and such was there when such and such happened”. And to make matters even worse, this issue does it in spades where this ‘technique’ is concerned. Thankfully, it did not spoil my enjoyment all that much – strange. You know that Japanese chap in this issue, ‘Mr Takenaka’, right? Didn’t he look like Mr Miyagi to you – the one from the original Karate Kid film? (Sorry Jackie). Well, with him in mind, plus the whole flimflam nature of this plot-line, I have a compulsion to say ‘Wax on – wax off’. OK, so this issue has an eighties vibe, is kind of silly in tone, and is fun to watch. Therefore, what about that silly crime comedy ‘The Godson ’? I would have liked to have seen a slightly more focused tale, which had a structure that was more relatable and relies less of happenstance. That’s all – everything else was great. Jason Aaron has a very nice knack of presenting a story that is great to read, yet defies the conventions of structural story telling. How do you do it Jay? Is it pharmaceutical? Medicinal? Therapeutic? Also, you have a class sense of humour too.